Lot of iOS Devices users who use iPhone, iPad and iPods want to learn the ways of sharing their playlist. There are a lot of ways which you can share the playlist of yours with. Sometimes some of us want to share their playlist with their friends to enjoy it with them. Especially when you purchase new albums and songs and you are way too excited and want to it with your family and friends. Here you will learn how to share iTunes playlist you with your friends. Lets talk about iMyFone TunesMate which we will use to share our playlist with your friends before we get to talk about the actual steps to do so. iMyFone TunesMate is one of the tool that iOS users can use to tweak their management of iOS system on their iPhone/iPad/iPod and it can be used as alternative for iTunes but actually far more better alternative and easier to deal with than iTunes. And here are some of the features of iMyFone TunesMate. You can sync your data using iMyFone TunesMate without getting worry about erasing your data as iTunes do all the time. 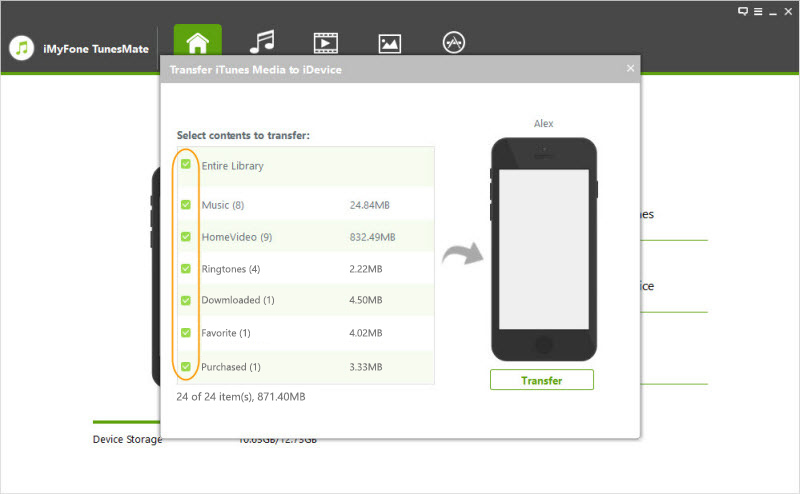 All types of media files such as music playlist can be transferred using iMyfone TunesMate while iTunes only supported the paid files. 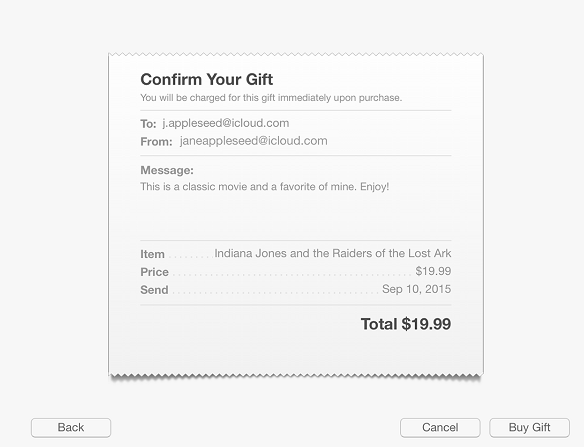 You can transfer iTunes library to your iPhone or iPad without typing the password every time. The music collection can increase by adding music files from any iOS device even from the devices of your friends. Step 1. Begin by launching iMyFone TunesMate on your computer and connect your iPhone/iPod/iPad through USB cable. Step 2. 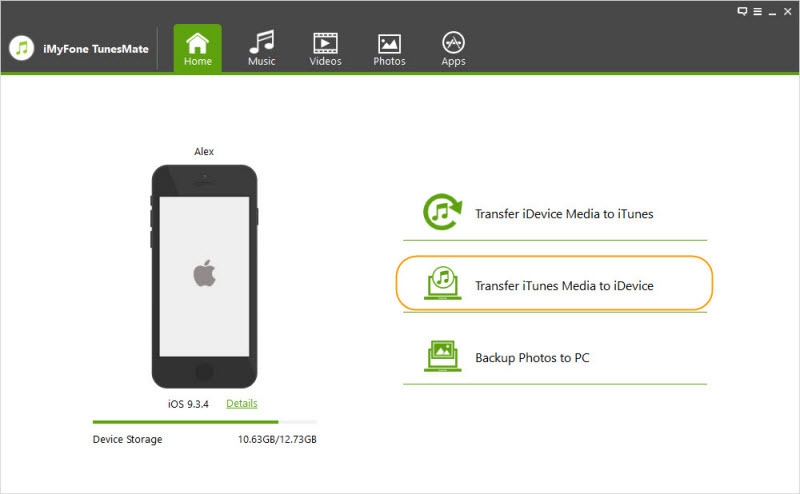 Now select the “Transfer iTunes Media to iDevice” mode which you will find in the home screen of the software. Step 3. After the scan process finished, all you got to do is choosing the playlist you want to share with your friends, then check it only and click on “Transfer” button. Step 4. Click "OK" button when it finish. This can’t be much simpler isn’t it? Just download and try it. If you want to share iTunes playlist using iTunes itself, then you can refer to iTunes to sync the playlists. Step 1. Connect your iDevice to the computer. Step 2. 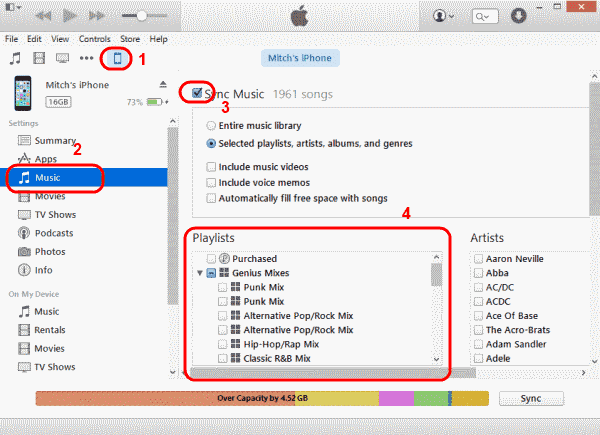 When it connect to iTunes successfully, select the icon for your device which is located at the upper-left portion of the screen. Step 3. Select the “Music” option. Step 4. Select “Sync Music”. Step 5. In the “Playlists” section, check the playlists you wish to sync with your iOS device. Step 6. Select “Sync” and wait for your playlist to sync to your iDevice. 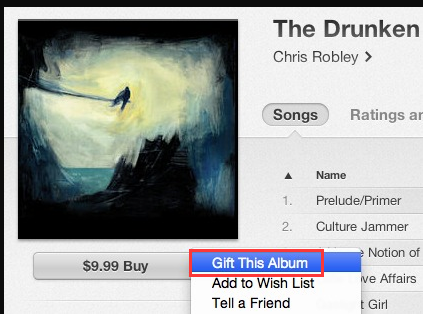 One of the ways that you can share your iTunes playlist is to send it as a gift for the people you want to share it with them. This method isn’t simple but you can say that it’s more elegant way to send your favorite music that you want to share it with your beloved people. And now let’s get down to business. Step 1. You need to start with opening your iTunes and please update it to the latest version. Step 2. Sign in using your Apple ID and enter the password of your account. Step 3. 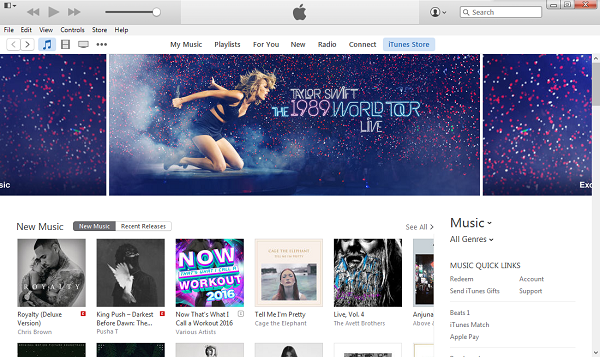 Now go to the iTunes store and find the item which you are looking for which in our case is Music. Step 4. To the right of the item’s price which belongs to music category click the arrow. And from the menu choose “Gift This Album”. Step 5. Now fill your payment information. Step 6. All you got to do is to enter the recipient email address pick the data you want to send to gift. Step 7. Just confirm the purchase and click on “Buy Gift”.